We will completely change this instance. There will sill be 10 bosses, but they will be fit for Lvl80 10-man raids. They will be fully scripted. Mobs, Items of Lore, Bosses, all the fun stuff. Expect T7 Badges from Heroic Naxx (25-man raid) to drop off each boss. 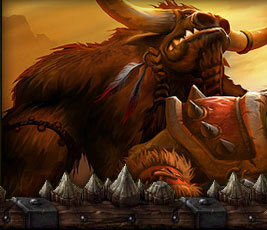 We will add very few mobs to the instance. There will be 5 bosses overall. You must kill the bosses in order from how they spawn. Your group can't just skip to the final boss every time, you guys will have to down each and every boss. Your troubles won't go unnoticed. This instance will drop T8 Badges, used to buy our custom T8 armor. Expect this instance to be fully scripted. Mobs, Items of Lore, Bosses, everything has a purpose in this instance. I mentioned Items of Lore in each instance description. Two "Two-Handed Swords" will drop of each of the final bosses. Molten Core's item will be easier to get. Onyxia's Lair will be a pain to get, as few groups will be able to get to the final boss of the lair. If you are lucky enough to get each sword, you can go through a quest to combine the two swords. If you are able to complete this quest (which will require you gather lots of items found in Herbalism, Mining, Enchanting, and our own custom items) you can create the most powerful item on our server. It will destroy any melee classes, it will devour casters, it will even demolish anyone trying to kite you. You cannot be stopped (unless you die, of course ^^). Really nice ideas dude, Let me know and I can give you a hand with the Boss Scripting. I have a friend scripting a massive battle. Over 200 NPC's are expected to be made, by far, the largest private server event ever created. However, the script will only be added if this server can take off. So get recruiting. you have any idea how much work that is?? Right, I'm home 'ill' today so I can do alot of work for the server, Just say what needs doing. Not the place to discuss it but Fraps or Hypercam should do the trick. Looks really good, need any help with items or scripting? I have a full version of Fraps (legal copy). if i can find the link to the download ill give it to you. I'm all for the video, but we need to get clips from our raid bosses and people just playing... also i got a great script idea though of already. When we test out our bosses... we'll use them as clips for a montage. We need a GFX artist to make an intro. Using an animation tool to shine 3-D lights (white) that will scroll across [Paradox WoW]. Ok, Well I have good editing software so i can do that if you like?